Thank you Helen for joining the Dishcloth-A-Day Challenge! The White Snowflake Crochet Dishcloth Pattern is now available in the Winter Dishcloth Crochet Pattern Set. I see the last row has picot stitches. However, there is nothing in the pattern itself showing WHICH picot stitch we are to use. After crocheting for a number (we won’t discuss this number)of years, I know there are several different ways to make a picot stitch. So are we to use whichever one we are most comfortable making? 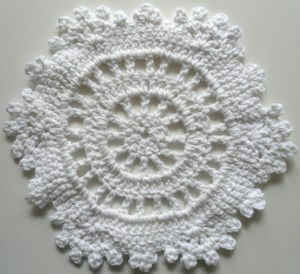 I have a round dining table and this little “washcloth” is about to become some placemats for my table !!!! It’s a delightful little snowflake. Thank you for sharing it with us, Helen; and you, Maggie, for choosing to publish it. I have so thoroughly enjoyed each and every one of these “washcloths”; although I must I admit I have not made one “washcloth” !! They all seem to end up becoming something else. Again, thanks for all the fun we’ve had this past year. I can’t wait to see what you have planned for us this coming year. Anticipation of looking to see what you have for us each day is remarkable. Thanks. And, I have enjoyed all the different designs. This part of things will be missed. But, can’t wait to see what you have planned next. thanks for sharing. I’ve made some of them to share with friends and family, and they all LOVE them too. 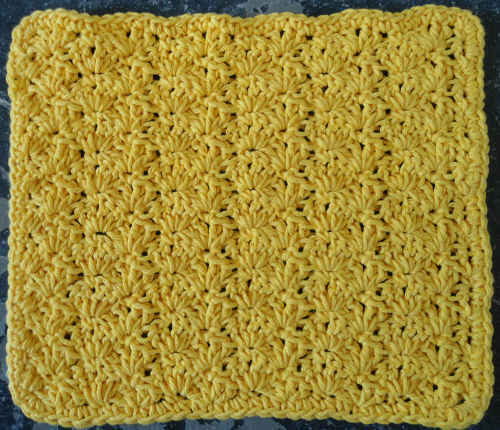 Just can’t beat a good Crocheted Dishcloth. I’m just curious…. Isn’t this dishcloth photographed wrong side up? dc, ch1, dc, ch 1, dc all in the same space) and to show that you only do a ch 1 after the 1st 4 dc and not after the last (5th) one. So yes, it’s written right and you will wind up with 5 dc in that space but only 4 ch 1 spaces. I hope I typed this so it is understandable.